Anne of Avonlea is the second of six Anne novels. The present volume finds Anne at age 16, teaching school, studying with Gilbert, forming a social club, and getting into her usual trouble. I am not sure whether I read Anne of Avonlea as a child because I remember none of it and I also know I could not get my hands on every book in the series. This one may have been one of the ones I pined for but never managed to track down in my book small world of the mid twentieth century. I thoroughly enjoyed this version read by Barbara Caruso. She narrates well and I will certainly stay with her as I listen through to the other books in the series. After a small break I will be on to Anne of the Island. There are many witty little events that happen in this book that I chuckled out loud at. Like Anne and a parrot that belongs to a next door neighbour. I liked the irrepressible Davy one of the twins that come to live with Anne and Marilla. His reasoning and thoughts often had me smiling. However Dora was a very flat character and we did not see much of her. Davy was a little jealous of the attention Anne gave to one of her pupils Paul Irving. I liked Paul too, but he was a little too perfect for my taste. In this book Anne spends two years teaching at the local school. As a teacher myself I identified with many of her thoughts and experiences and fully sympathised with her over her terrible Jonah day. Some of the views expressed, especially over physical punishment was before her time, but then again Davy would prefer a good walloping rather than the boring punishments meted out to him by Anne and Marilla. There is an author visit that excites Anne and Diana, a mishap with a plate that lands Anne in one of the funniest situations, I could imagine a cartoon of it and made a note to look at a physical book to see what illustrations are in it. I'd actually like to buy a set of Anne books so I am looking around. Any suggestions for a good version - let me know. Anne is still full of imagination and romance and her heart receives a fullness of it, although at this point Anne is more interested in matchmaking romance for others, rather than being ready for her own. We leave Anne here at the age of eighteen, ready to go off to college. So happy I made it a priority to listen to this book. The book I think stands the test of time. I have the first book in the series, planning to re-read it. Like you, I couldn't get my hands on all the books, so there are more I want to read. Thanks for sharing. I'm glad you enjoyed the audio. I haven't gotten myself to watch the new Netflix (or was it Prime?) series. I slightly remember the Canadian VHS movies and loved them so much. I know some knitters didn't like the new version. 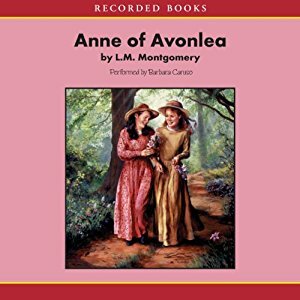 I read an abridged version of Anne of Avonlea a few years ago- but listening to it must have been an entirely different experience! I'm so glad you enjoyed this! I had forgotten about the plate incident but I had to giggle just thinking about it. Paul is definitely on the too perfect side and Dora is definitely flat. There's a scene at one point where Anne is thinking that while Dora is better behaved she likes Davy much more. Anne of Green Gables is big in Canada because it takes place in Prince Edward Island. My family and I watched the movie several times, and they also had a series based on it. Glad you enjoyed the audio version of it. Except for Anne of Avonlea, the books are all new to me. I personally only own a Kindle copy of the series. I've been looking for a great set of physical copies to own as well. I have no idea if they have illustrations; that never occurred to me! Now I certainly want to look into it. I'm so glad you're joining us on this journey! I can't wait to see what you think about the other books in the series. Yes Barbara does narrate the full series. I think there are other narrators who have done a great job too, but I decided to stick with her because she is very good and that's all I ask!